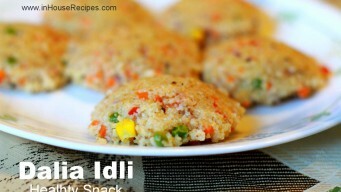 Vegetable Dalia Idli is a unique dish which is made with Broken Wheat (Dalia) and Vegetables in an Idli's form. Trust me, it is a great food for kids. They can enjoy something new and different and at the same time get all the nutrition from it. Try it once and you will fall in love with it. Heat Oil on medium flame in a pan. It would take about 2 minutes. Once Oil is hot, add Mustard Seeds and roast for 5 seconds. Add chopped Onion and roast until it becomes pink in color. Once Onion has turned pink, add Carrot, Peas, Capsicum and Salt. Mix well and let it cook on medium flame for 2 minutes to help soften the vegetables. After 2 minutes, switch off the stove and transfer the vegetables in a bowl. Add Dalia Porridge or Broken Wheat and Curd in the bowl with vegetables. Mix well. Add 1/4 cup of water. Mix well. Cover the lid and keep it aside for 10 minutes. After 10 minutes, we can steam the mixture to make Idli. Now grease the Idli Stand with Oil. Add the Dalia mixture in greased Idli stand holes. For steaming Idli, Add 500 ml of Water in a pressure cooker. Place Idli stand inside the cooker. The water level in the cooker should stay below the lowest Idli tray. Cover the Cooker with its lid. Do remember to remove the whistle/weight. Let it steam/cook on medium flame for 20 minutes. After 20 minutes, switch off the stove. Idli would have been steamed properly. Carefully pull out the Idli stand from cooker and transfer Idli’s to a serving plate. Hot Vegetable Dalia Idli ready to serve. 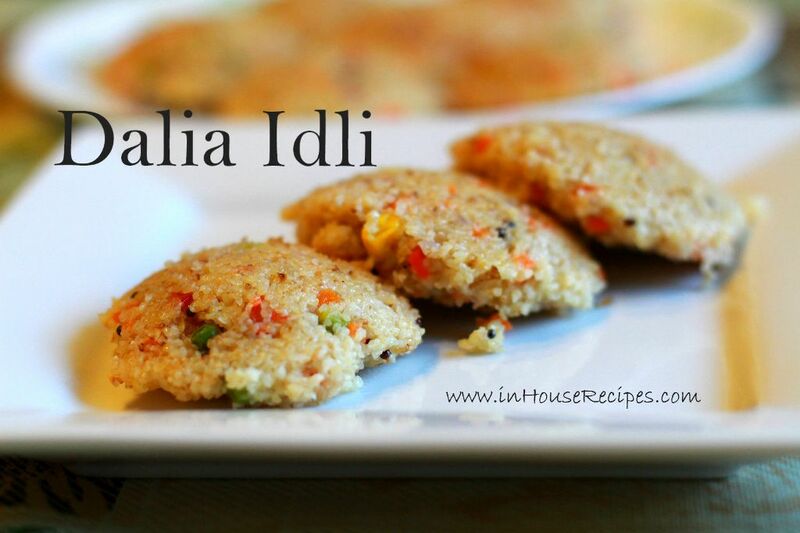 Dalia Idli can best be accompanied by Coriander Chutney or the south Indian Coconut Chutney. You can even try the Spicy Garlic Coconut Chutney if you like the high spice content food. 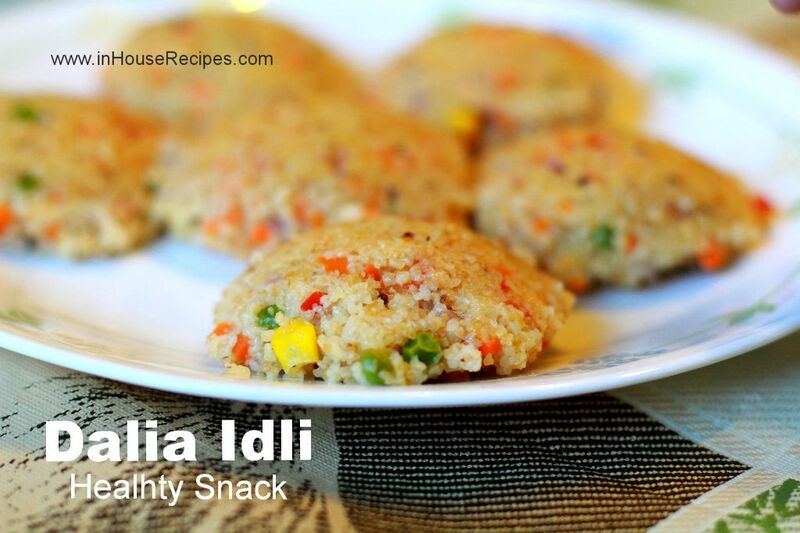 Dalia Idli can be refrigerated for up-to 2-3 days. Re-heat it in Microwave before serving. 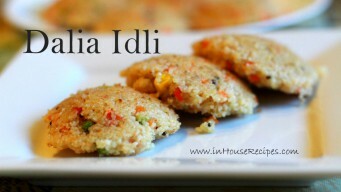 Some people also like to slice the Dalia Idli into pieces and then add tadka just like this masala Idli.